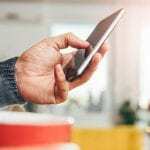 You may remember our previous blogs on intelligent lighting and how it can enhance your property (see blogs: part 1 and part 2). Well, we thought we would take a quick look at some of the top professional smart lighting solutions from Rako, Lutron and Control4. 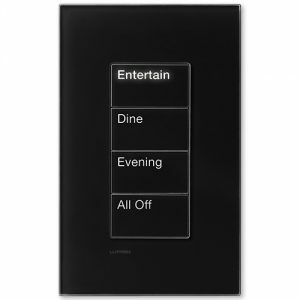 ‘Bespoke light switches’, ‘Lighting scenes’, ‘Remote/App control’, ‘Energy Saving’, ‘Retro fit’. These are all terms used when considering professional smart lighting solutions and very much the main selling points. At Pro Media Solutions we have lots of experience with various lighting control systems and we get special insight into exactly what they are capable of – from small single room installations to much larger properties. So here is a brief review and comparison. Let’s start with the UK designed and manufactured solutions from Rako. In terms of pure intelligent lighting control this offers the ultimate in flexibility. The system can be installed in various ways: wired, centralised and wireless. It can be retro-fitted so conventional lighting can be replaced with a Rako system via battery powered keypads. These have a battery life of 3 years (based on 30 button presses per day) and looks and reacts the same way a standard keypad does, but without the need for new cables which avoids mess or the need to re-decorate which is a big plus! A central controller may not be necessary so individual rooms can be converted quickly and easily, allowing lighting control remotely via app control as well as Alexa (and soon also via AppleHome kit and GoogleHome) and on-wall keypads. Although Rako does not have the ability to mesh wireless keypads together, their wireless range is great as they use a sub GHz protocol for communication. 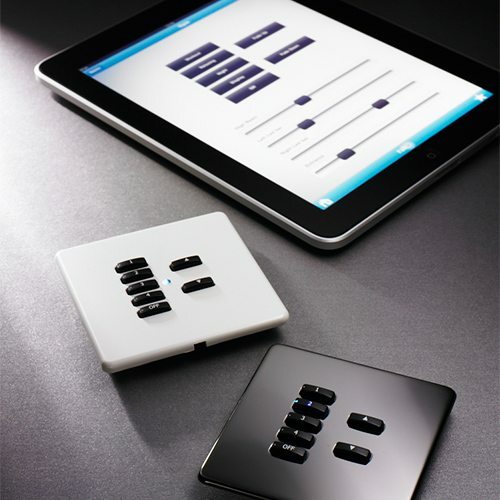 The keypads are available in a variety of finishes and button combinations. Due to the size of the buttons however, personalisation can prove somewhat limited. Which brand produces the most aesthetically pleasing and bespoke products? With fully customisable designer faceplates and a solid system Lutron is the product for you. 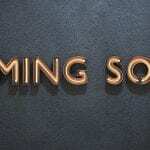 Being the longest established intelligent lighting brand of the three, Lutron is almost a household name and has a well-earned reputation for quality and one of the highest product reliability ratings in its class. For these reasons it is a premium priced brand. They offer a large range of products and solutions including wired and centralised, as well as the new wireless range – similar to Rako and Control4. 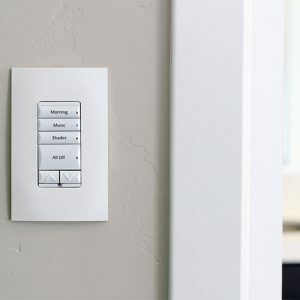 Their extensive range of faceplates and integration with their near-silent blinds, along with the means to interact with other manufacturers’ HVAC, security and some AV equipment as well as bespoke engraved keypad buttons as standard, Lutron tends to be the choice for many. So, what does Control4 have to say on the matter? They provide a reliable solution of wired, centralised and wireless installations. Like Lutron and Rako, access is available via Apple and Android apps and on-wall keypads, plus additional remote control and touch screen options. The keypads are available with a range of plastic, metal and glass faceplates with the option for bespoke engraved buttons*. The big difference is that the Control4 system has the highest level of expansion. All three offer the benefit of shade and multi-room audio control but Control4 doesn’t stop there, it offers full home automation control with the means to integrate with most smart home products on the market: HVAC, audio visual, sprinkler/pool systems, electric doors and windows, security systems and smart locks to name but a few. As Control4 is also capable of controlling both Rako and Lutron systems, it truly offers endless possibilities – and not just in terms of lighting. If you are interested in an intelligent lighting system for your home, why not speak to a member of our expert team on 0345 505 1760 or email us. You can also follow us on Facebook, Twitter, Instagram and LinkedIn for all the latest smart home news and products.